On Women Worldwide, we often talk to influential women about their passion and how it has inspired the product or service they provide. But what if your product involves sharing a piece of your own spirit? Such is the case in the art world, where a professional’s product is as deeply personal as it gets. Joining me on the show is New York-based artist Kathy Butterly, known for bringing a painterly sensibly to her idiosyncratic ceramic sculptures. Kathy Butterly was born in 1963 in Amityville, New York. She received her BFA at Moore College of Art before earning an MFA at University of California Davis. She lives and works in New York alongside her husband and fellow artist Tom Burckhardt. Kathy has exhibited across the United States, and many of her works are in the Permanent Collections at the Museum of Modern Art, the Detroit Institute of Arts, and the Carnegie Museum of Art. Get a behind-the-scenes look at the creative process of an incredible artist as Kathy shares her inspirations, breaks down her relationship with her materials and work, and talks about blending her professional and personal lives. Today’s episode of Women WorldWide, which features a Visionary Woman Award winner, is being sponsored by Moore College of Art & Design. 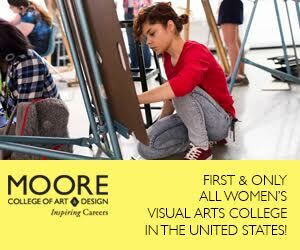 Moore’s the first and only women’s visual arts college for undergraduates in the United States.